The reason I wished good luck to the editor? Because of the task involved in ensuring that The Mirror Empire was not *too* challenging, while still retaining all of the flavour and the authorial voice, and allowing Kameron’s ambitious vision to be realised. 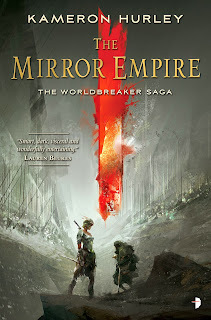 Because I am the editor of this novel, I cannot provide a review of The Mirror Empire, so instead I am going to tell you about the experience of editing it. On a personal level, I would say sincerely that, were it not for my experience with analysing the Malazan series for Tor.com, I would not have been able to edit The Mirror Empire. That series taught me patience in waiting for reveals, trusting the author to know where they were taking plotlines, and recognising that every now and then we, as readers, do need to be faced by a work that makes us think and expands our horizons. On another personal level, I had edited YA novels mostly to this point and the idea of tackling well over 700 Word pages of manuscript was like a personal Everest! And finally on yet another personal level, I was starstruck. Yep, I still get this way with authors I admire. How can I possibly tell an author who is such an effective wordsmith that they can improve their work? Well, that is the role of an editor! To take the novel in front of you and consider what is going to make it better. How is the pacing? Is the author effectively carrying their reader with them? Is every scene necessary to drive forward the plot? My next key issue was with the agency of the character Lilia. Although she was a young character, and therefore probably more inclined to follow adult reasoning and decisions rather than making up her own mind, I felt that she was incredibly passive. She needed more agency and work on her storyline to ensure that readers would engage with her. It didn’t take me more than a few pages before I wanted a map. And, when Kameron suggested the idea of a glossary, I leapt all over that as well. It IS a hard novel, and anything that assists the reader in understanding locations and terms rather than having to spend time puzzling them out, hence removing them from their immersion in the novel, is welcome. 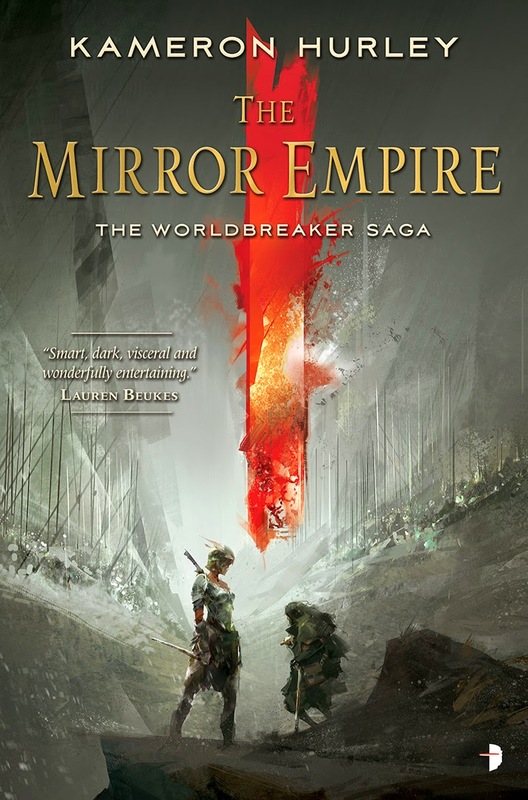 The gender aspect of The Mirror Empire is obviously a key part of what makes it so seminal in the fantasy genre – the understanding that characters do not fit into boxes, or onto a very black and white spectrum. I had dual concerns about this that I felt Kameron should address. One was that it felt as though the gender aspect was rather dropped in after a number of chapters, so felt a little bit whiplash. I wanted to see it introduced more gracefully and gradually. The second point was ensuring that, at no point, did it feel as though the genders/relationships described were there simply to play with gender – they had to feel organic within the world. My key style of editing is to always try and approach a novel as though I were a fresh reader – someone who has no idea of the ultimate direction of the story, and who is starting this novel with absolutely no preconceptions. Because of this, the manuscript that I returned to Kameron had lots of questions: ‘I don’t understand why this character is acting in this way?’, ‘How would we know that this had occurred without seeing more of it at an earlier stage?’ I acted like a reader who needed to have a really good grasp on all the world and the characters in order to enjoy the novel, and so asked the questions I felt needed answering in order to improve the experience. I also suggested gently that Kameron reduce the novel by between 10,000 and 20,000 words. It is a beast of a novel, and was even longer when I received it. Some scenes felt a little filler, so I marked out what I felt could be removed and still keep the novel focused. I guess every editor is apprehensive when they send their editorial letter and the marked-up manuscript to their author. Obviously, WE think that we are making good suggestions, but there is always a fear that the author may disagree, or feels as though you are changing the ultimate nature of the novel. I think that we just have to be as diplomatic as possible, and always let the author know that we are editing the novel because we acquired it, which means we LOVE it. All of the suggestions come from a position of partnership, rather than criticism. My final point is to refer to the reviews that I read of The Mirror Empire. Yes, I’ve been reading them! I’m so very glad that people are enjoying this novel and, indeed, finding it clever, complex and challenging. But please do not fool yourself that when I read something that suggests this section is too difficult, or that scene feels surplus, or this, or that, or the other, that I don’t kick myself and wonder if it’s something that I should have picked up as Kameron’s editor. I wanted this novel to be the very best it could be, and I think I helped somewhat, so it feels like a personal failure if readers then fail to engage. Even when it is just one reader. Editors, as well as authors, sometimes read reviews and have to bite their tongue or take a deep breath and accept valid criticism! Thank you for reading this insight into how I edited The Mirror Empire, and I sincerely hope that you enjoy the novel when you choose to read it. what an interesting post - a perspective not often seen. Please do more of this. Also, welcome back to the blogosphere! This is a fascinating perspective, so thanks for shining a light on the work of an editor. I'm giving and receiving a lot of beta critiques at the moment, and the matter of questions often trips me up. Readers are supposed to have questions as they go through a story. Without questions there's no hook to keep us turning the pages. So the difficulty is working out which ones demand an answer, and which ones are a sign of good storytelling. I don't think there's a right answer, I think it's an art and it's impossible to write a book that will cater to every kind of reader, even within one subgenre. The Mirror Empire sounds fascinating, and for me that's because you've said it's challenging, not in spite of that. I am reading Mirror Empire. I LOVE your perspective about it! The author has trusted me to figure things out and I have trusted her to help - and so far, it's working beautifully. This is no doubt in part because you were a good editor, so thank you!